The Billcon D-551 Currency Discrimination Counter allows operators to be more efficient and cost-effective, they spend less time counting and more time helping customers. No presorting is necessary. Simply choose your settings, place the bills in the hopper, and go. The D-551 counts the bills you want to count, and automatically diverts the others to the large 100-note-capacity pocket. Everything is performed quickly and accurately with no need to stop midway through the process. 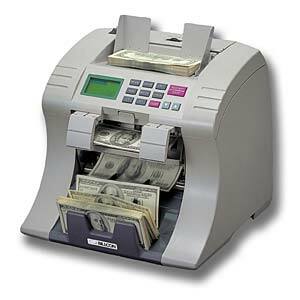 The all-new Billcon D-551 features advanced high-speed denomination recognition technology, six modes of counting bills preset batching and a blazing 1,200-notes-per-minute speed. Billcon’s unique full-line sensor accurately distinguishes between the six denominations of U.S.bills. Click Here for Billcon D-551 Brochure.